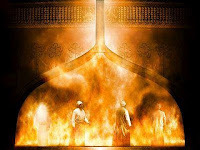 If you read the story of Shadrach, Meshach, and Abednego you will be amazed at the story. I will make it short. There were three guys who hung out together all the time. They were connected to the kings family some kind of way through the daughters or something. Anyway all they did was drink and party with the king and his entourage. One day the king said hey guys listen if you are going to hang out here, you are going to have to worship my gods/idols. Well these guys were raised by God fearing families and they weren't going against God himself. They knew better, no matter how drunk they were. So the king told them okay party over dudes, and since you are going against my gods/idols and won't renounce your God I am throwing you in the fire pit/ stove. They were thrown in, but as they were one of God's angels came down to protect them and all they felt was a warm breeze blowing. They were surrounded by flames but weren't burning up. Instead of panicking they sang praises to God for everything. From the birds to the sky. The sea, the rain everything. They did this for hours. Finally the king had to let them go. You can find this story in more of a Biblical text in the book of Daniel 3.